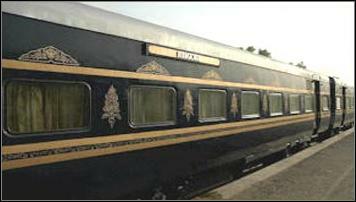 The Rajasthan Tourism Development Corporation Ltd., an enterprise of government of Rajasthan operates luxury train, the Heritage on wheels in collaboration with the Indian Railways. 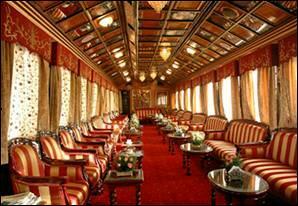 Backed by the global success of the Palace on Wheels, Rajasthan Tourism Development Corporation and Indian Railways in their first ever endeavor take you on board The Heritage on Wheels, a luxury tourist train on meter gauge en-route the unexplored regions of Bikaner and Shekhawati, famous beholders of the Heritage of Rajasthan. This beauty undertakes the journey into the rich past as the itinerary of Heritage on Wheels is designed to take you beyond the big cities of Rajasthan, faces to face with the real art and culture of the masses that have not been overtly influenced by royalty. To bring in title adventure into this land of heritage, you are also brought unimaginatively close to the magnificent herds of black bucks, galloping over the grass lands of Tal Chhapar sanctuary. We have exclusively designed this luxury product catering to domestic/corporate segment studded with all luxury amenities on the lines of The Palace on Wheels with most affordable price! 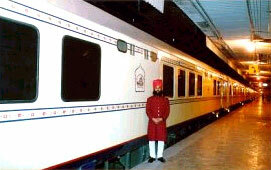 In order to access smooth connection, we have eased out the itinerary by taking guests from Delhi up to Jaipur and back with local sight seeing of Jaipur before boarding the World class HERITAGE ON WHEELS trip. The above special feature here is that we are providing this special trip for our valued guests the return trip to DELHI to add the silver lining to this program! We would provide you the following services as per the program mentioned at the epilogue of this message.